Casual bikes are the neighborhood cruisers. 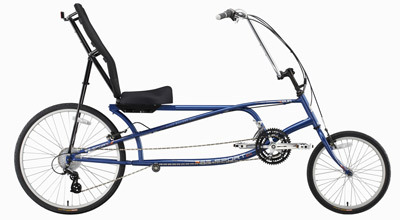 These are the bikes that we put everyone on if they have never ridden a recumbent. These are the easy bikes of Easy Street. All our casual bikes are long wheelbase. The bike sprawls out to make room for you. You can turn tight turns without concern about your legs contacting the handlebar or tires. The upright seat gives your balance functions the kind of head position they are used to. The tapered seat base makes it easy to put your feet beneath you. The low crankset height makes for an easy step between the pedals and the ground. We don’t sell that many of these bikes, important as they are. Most people who want easy riding opt for trikes nowadays. 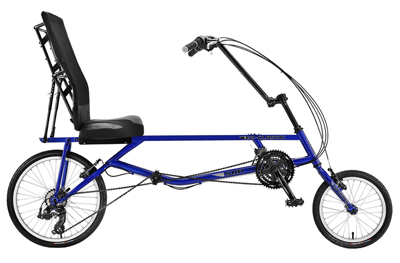 But if you like the feel of a two-wheeler then you still enjoy huge safety benefits being in the recumbent position. If you plan to ride around traffic you may appreciate the higher seat a two-wheeler gives you.